Minimally Invasive – The procedure requires no incisions be made, but instead an ultra-fine needle being inserted directly into the desired location. Anesthetic may be used but is not necessary. The pain you feel is no more than that of any other injection. 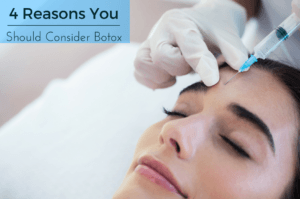 Quick Procedure – A Botox injection can be taken care of in roughly ten minutes and can provide almost immediate results. Typically, the surgeon may request that you frown or squint to showcase the problem areas to be targeted. No Recovery Time Needed – Since Botox injections can be done without any anesthetic, you can resume your daily activities right after leaving the procedure. Many other cosmetic procedures can take a week to recover and result in facial bruising, but the simplicity of Botox injections allows for a speedy recovery. Real Healing – Despite being described as an injection, the Botox or botulinum toxin isn’t filling the wrinkles in, but instead, it relaxes the muscle beneath to give a natural volume to your skin again. Differing from person to person, more treatments will be needed in the future, but the initial results last between 3 and 6 months providing you with lasting effects. If you are looking for a non-invasive way to reduce wrinkles quickly and effectively then Botox treatments are perfect for your needs. Dr. Roach can attend to your wrinkle concerns and rejuvenate your skin to your desires. Call the Bayside Center for Plastic and Reconstructive surgery today at (813) 528-8744 and get a free consultation today.